Mon, 04/04/2016 - 08:47 Elise D.
Upgrade your Pepper and developer tools now! Please, read below in order to get more details. You can download Choregraphe and the developer tools in the resources section. This release has fixed important bugs about the audio system. You have maybe noticed a bad synchronization between the Text to speech and the Automatic speech recognition or other bugs in dialog that result in a random interaction with Pepper or the robot stops talking. Many of those issues have been fixed and you will now take advantage of a better interaction with your robot. We are pleased to announce also that this version is supporting a new “cool” device, the charging station! Once the charging station received and installed, configure the automatic usage of the Charging Station through the settings menu. Please see more info in Charging Station Settings in the documentation. The release 2.4.3 also includes improvement on the tablet that displays now the factory reset command and allows you to wipe your data directly from Pepper‘s tablet. Before performing a Factory reset, make sure you have previously backed up your robot data. You will find more details in the Back up my Aldebaran robot user data section of the documentation. 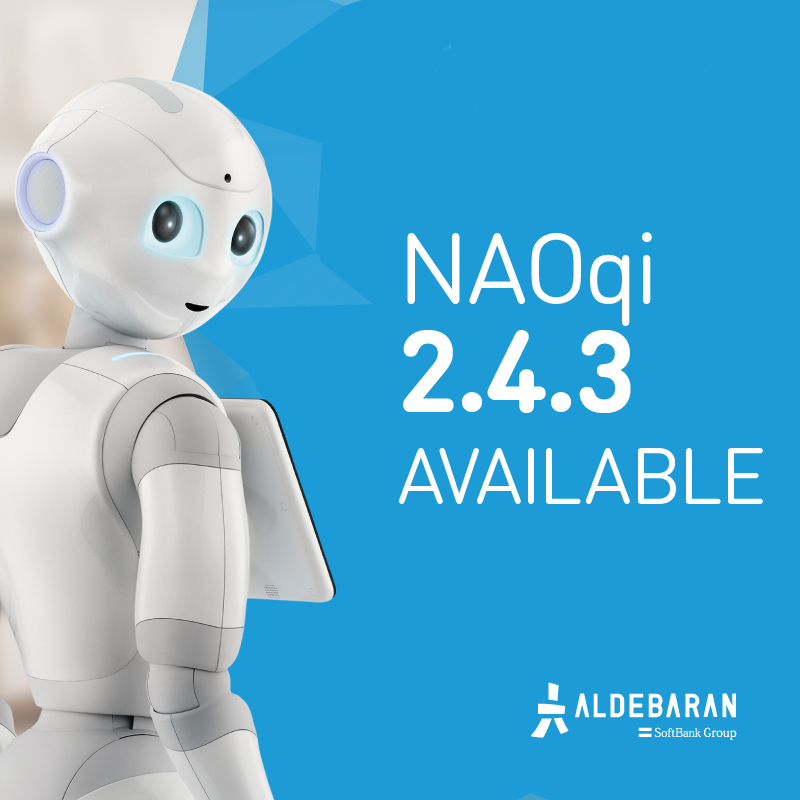 You can find more details on NAOqi release 2.4.3 in the release note and the changelog in the documentation. Touch the display and start Setting Application from the application lists. The available update notice will pop-up. Touch the “Upgrade Now” button. The Pepper will restart automatically after a while.